Hi, Uncle. It’s been three months since you’ve been gone. I was reminded of your passing this morning when I noted the date on my watch. I thought of my last moments with you. Only this time, it was a little more difficult for me to piece it all together. The memory is a precious one. I fear that I may forget some of the details by the time my children are old enough to appreciate the story, so I have decided to write about it now. I think I learned about your battle with Pancreatic Cancer in mid-late 2017. At that point, I am not sure how long you were living with that diagnosis. I quickly did a search on the internet and was crushed to learn the average life expectancy was five months. 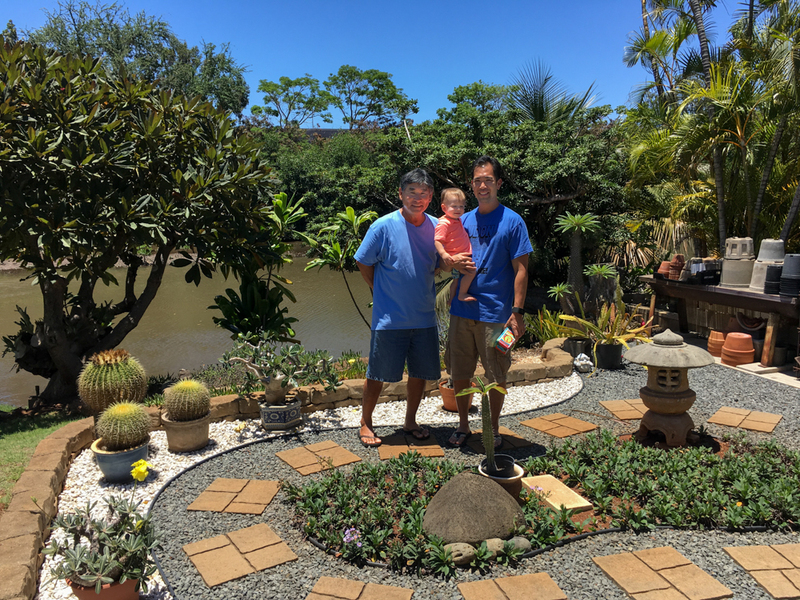 We already had plans to visit Hawaii and celebrate Maiko’s first birthday in the summer of 2018, much like we did with Dorian a couple of years ago. I was looking forward to introducing her to you, as well as showing you a three-year-old version of Dorian. 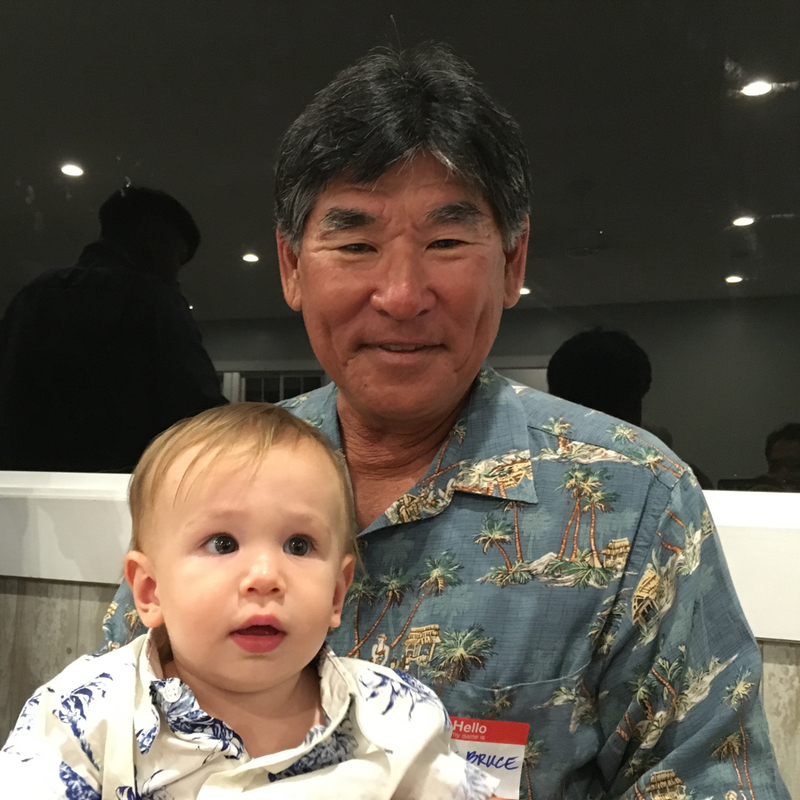 Uncle Bruce with Dorian at his first birthday party in Hawaii, 2016. I got word in early May that you were hospitalized and not doing so well. I checked with Angie, and we were able to get her a few days off from work. I booked a quick trip to see you. I spent about 35 hours of total travel time to be in Hawaii for 48 hours. I walked into your hospital room, much to the surprise of you and Uncle Craig. You were both watching some sports program on the television. I had not told either of you that I was coming for a visit. On the journey from Bangkok to Hawaii, I was trying to prepare myself for seeing a cancer-stricken version of you. I remember when I came back to help care for Grandpa in 2009, it was a similar journey and mental preparation. However, on both occasions it was shocking and gut-wrenching to see my loved ones reduced to such a state. I imagine it might have been easier to manage if I had been there with you throughout the process, but I only caught you at the end of it, really. 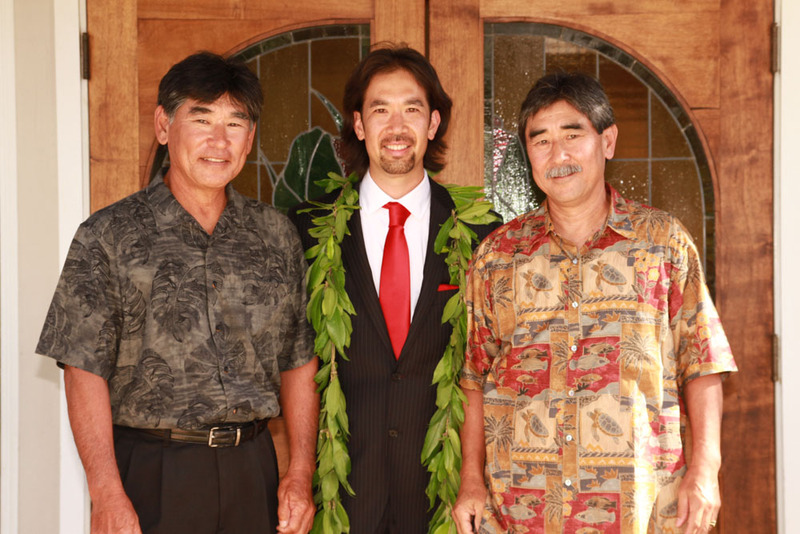 Uncle Bruce, Corbet, Uncle Craig at the Wong Wedding, 2013. There was a lot of uncertainty in regard to your discharge that day. You seemed unsure about leaving, while the hospital and insurance company seemed to be pushing you to go home. It was a difficult situation to witness, and I felt like the medical system can be utterly heartless at times. There wasn’t much for me to help with, but it felt good to just be in your company. Ultimately, you were sent home that day. Over the next day-and-a-half, I spent time a lot of time with you and Uncle Craig. You were resting a lot, so it was actually a great opportunity for me and Uncle Craig to catch up a bit, as I hadn’t seen him in person for a long time. I bought you some plain shave ice from Baldwin’s in Waimalu, seeing that you were liking the ice chips in the hospital. I got you ice water from time to time when you asked for it. Hey, that reminded me so much of when you first moved back home to live with us at Grandpa’s house. You had suffered a back injury at work (herniated disc) and had to spend a lot of time in bed, recuperating. I was young, elementary school age, I believe. We had one of those tall, Japanese, insulated thermos’s that would dispense water when you pressed the top. There was a water level gauge on the side, and I remember filling it up for you. I guess I was your water boy since childhood, huh? Well, those 48 hours went by so quickly. I don’t know how anyone can prepare for those final goodbyes. I suppose I am grateful for being able to see you and that your mind was sharp in spite of your body’s decline. Our relationship wasn’t so much a verbal one. My relationship with Grandpa was similar. Not much talking, but lots of love in other ways and supportive actions. Our situation felt like trying to squeeze a lifetime of love into a few moments’ worth of words. Difficult, indeed. It got heavy, to say the least. I had been watching TV with Uncle Craig. I knew I had to leave soon but struggled with making that happen. Every time I thought about standing up to say goodbye to you, I had to fight back tears. So, I just kept trying to gather myself with the distraction of TV. This went on for some time until I realized that it just wasn’t going to get any easier. Plus, there was a big part of me that simply did not want to leave. Finally, I mustered up the courage to begin our goodbye. I walked over to your bedside, told you I had to go, and apologized for not being able to stay longer. The floodgates opened, as I broke down and wept with a depth that made every gasp for air sharp and painful. We held hands, my left hand in yours. You gently pat the back of my hand with your free hand and told me, “It’s okay, Corbet. It’s okay. I understand.” I lowered my forehead and rested it on the back of our joined hands. Several seconds passed. You broke the silence with, “No matter how long or short…you came…to show your love for me. I love you.” I told you that I loved you and that I hoped you knew I would stay all the way if I could have. I began to tell you of my family’s upcoming visit to Hawaii the following month, only to feel stupid by talking about it. I think we both knew that you weren’t going to be there when I came back with my family. I thanked you for everything, stroked your sprouts of grey hair, and told you not to apologize for anything. I made sure to tell you that you were a good guy and again that I loved you. You shed a single tear from your left eye. It was powerful. You were never the crying type, even with the passing of each of your parents. When Granny passed away, it was my first experience with a lifeless body. You were holding her hand and invited me over. You told me it was okay to touch her if I wanted to. I remember your calm demeanor. You had that ability to be so kind and peaceful in those moments. Flash forward some years later when I came home to help care for Grandpa in his final weeks. The first thing you did was show me your guys’ bathroom routine. You were so good about telling me that if I was uncomfortable with any of it, it was okay. When he passed away, I remember when people came to pick up his body. You were so loving towards Grandpa as they took him to the transport vehicle. I was a mess, but you seemed to be at ease with it all. It was as though you had a way of understanding it all, a peaceful acceptance of sorts. Driving back to the hotel was incredibly difficult. Nothing about that drive felt right. It didn’t feel right to leave you in such a state. I felt like I needed to be with you. I debated whether I should have turned around to give you one more hug, one more “I love you”, one more goodbye. I finally decided to just let it be. I don’t think you would have minded if I popped back in, but I also felt that you were content and ready to move on. One week after my visit with you, I learned of your passing. Interesting thing is, I woke up to the sound of your voice telling me that you were going to go. I reached over, unlocked my phone, and checked my e-mail. There in the inbox sat the message from my mom. The sadness came with relief, knowing that you were no longer in pain. You passed away on Dorian’s birthday. Did you know that? Perhaps I should thank you for making it easy for me to remember the date. Unfortunately, I was not able to attend your funeral service. I did, however, write a letter that was read on my behalf. Our longtime family friend, George Hokama, was generous in agreeing to speak in front of everyone in attendance. The following is what I wrote to you, Uncle. First of all, a big mahalo to everyone in attendance for honoring my Uncle Bruce’s life. It is with great sadness that I write this message in lieu of my family’s absence. When I think of Uncle Bruce, one word comes to mind: ‘simple’. He was a simple man. Much like his father, he lived and loved with a quiet strength. Together, they served as the primary, positive, male role models in my youth and young adulthood. I am proud to have been so strongly influenced by such simple, wonderful men. It was the summer of 1988. I was 11 years old. Uncle had decided to take me fishing…a lot! We went fishing several days a week, and it was an all-day affair. He had gotten into fishing for halalu at Waianae and Haleiwa boat harbors. My only prior fishing experience was from our backyard, fishing for tilapia with bamboo hand poles, plastic floaters, and bread. Suddenly, I was introduced to a whole new world of fishing. Uncle taught me how to ‘whip’, using a rod and reel to cast blue, rubber lures into the boat harbors. We used to put a pink, plastic bead at the top of the hook to help attract the fish. He showed me how to roll a folded piece of fishing line on his thigh, creating a permanent twist that would serve as suspension when passed through an egg-shaped weight. We each had a flat, white, spool with holes around one edge. Uncle showed me how to individually pre-wrap leader lines onto the spool and label them with tiny pieces of masking tape. This made changing leader lines really fast when the fish were biting! For all you non-fishing people, a leader line is simply the section of fishing line that connects to the hook. Being able to change them quickly meant you could spend more time fishing rather than fiddling with your gear. Waianae and Haleiwa boat harbors have walls made of big boulders. From these rocks, all the fishermen would form a line when fishing for halalu. I began that summer waaay off to the side, where I would practice casting. In fact, I once got my line wrapped around a boat’s railing in Waianae boat harbor! When I developed enough control, Uncle brought me to the line, taught me proper fishing etiquette and how to hang with the rest of them. I remember one evening, sitting at the kitchen table with Uncle. He drew me a picture on a napkin, illustrating the most effective way to cast and reel in the lure through a school of fish. That one lesson improved my understanding of how to be more successful on future outings. I can remember being at Waianae boat harbor and thinking of that drawing while I was working on my ‘whipping’ technique. Would you believe that by the end of that summer, Uncle had groomed me into a pretty legitimate halalu fisherman/fisherboy? His passion for fishing was inspiring. One day, I remember Uncle taking me to Goodwill. He purchased a small pot and hot plate. At home, I observed closely, as he learned how to make his own fishing lures, melting the rubber in the pot, letting it cool, then cutting them into strips. Some time later, he added the technique of ‘jigging’ to his skillset. He would make his own jigs, placing a pink bead at the top of the hook. Then, he cut tiny strips of rubber from latex gloves and wrapped them around the rest of the hook. I think he used super glue to hold it together. It was fun to be around someone who was constantly learning more about his craft. As I write this, I am being flooded with more memories from that summer. Hey Uncle, do you remember when you let me drive your blue, Chevy pickup truck in the Aloha Stadium parking lot? You were teaching me how to drive stick. That was scary, but fun! Speaking of fun, remember that one time when you drove us all the way home from Waianae boat harbor without once coming to a complete stop? You strategically slowed down to a snail’s pace at some traffic lights but never stopped. Oh man, that was hilarious! We had so much fun that summer, didn’t we?! While visions of you sharing similar experiences with my children shall not come to pass, it makes me appreciate even more the time that I got to spend with you. I am so sorry for not being there today, Uncle. I find comfort in trusting that you understand, just as you understood my brief visit a few weeks ago. I am glad that I was able to see you, thank you, and tell you that I love you. I know you don’t care much for traveling, but please feel free to visit me anytime. I’ll be listening for you. Uncle Bruce’s Landscaping with Dorian (1yr) & Corbet, 2016. Our summer trip to Hawaii was bittersweet. It would have been great to see you with our children. I am glad that you were able to see their latest photos and videos before your departure, some of which I shared at your bedside. I wonder if everyone has moments where mortality becomes real. Losing you has hit me harder than when your parents passed away. I think it is somewhat generational. It was easier for me to understand and process their loss given their stage in life. You are only one generation above me and the youngest of three siblings. Life suddenly feels more real, more fragile. I am disappointed that our relationship is over, at least in this world. The summer of my wedding (2013), you and I had a great heart-to-heart talk. It was the first and only one like it. I felt like it was the beginning of something new for us, a new chapter, and the future looked bright. I am sad that we will never get to build from that experience. 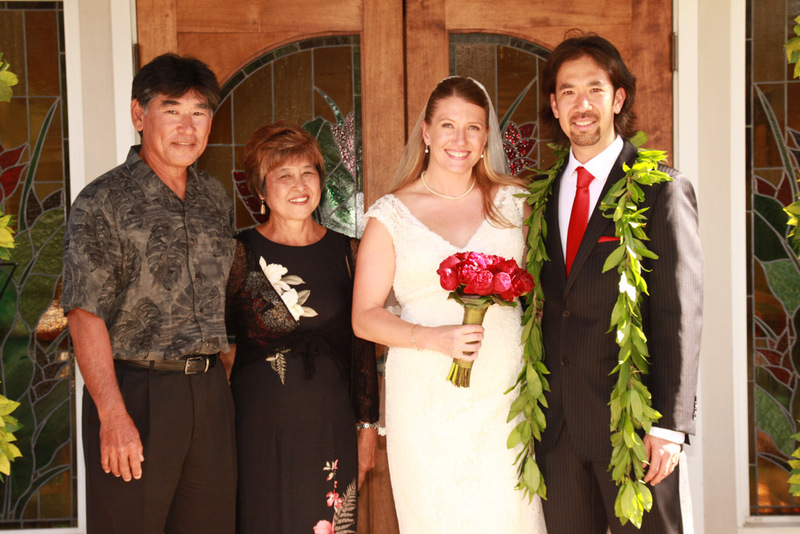 Uncle Bruce & Suzanne at the Wong Wedding, 2013. I’ll make sure to share stories of you with my family. You are, and will be, remembered. I love you, Uncle. Corbet, I am so glad to know that you grew up with such kind hearted men as Uncle Bruce, and your Grandpa. Thank you for sharing your feelings, and giving us a good glimpse at your youth! I offer our love to you, and our prayers for continued healing. The goodness of your uncle lives on in you, and in your children! Thank you for the love and prayers! And yes, I had mentioned to Josh how special it was to go fishing this summer. The timing of it all was perfect.